I love attending professional development conferences. I really do. I love the change of scenery for a few days, the networking, the enthusiasm, the free food, (c’mon, I know I can’t be the only one) and last but not least: the knowledge waiting to be learned and implemented. It’s always fascinating to see what other companies are doing to market themselves and gain new customers. A few weeks back, I had the opportunity to attend the Inbound Marketing Summit 2013 in Boston, Massachusetts. Put on by the Digital Pulse Network, the presenters and attendees ranged from Chief Marketing Officers, marketing executives and multimedia professionals; all from different types of businesses and all under one roof. Though I took away quite a few things from this two-day event, here are my top two takeaways when it comes to the digital world of electronic manufacturing. Hopefully your electronic manufacturing company (regardless of the size) has a website. However, is it a good one? 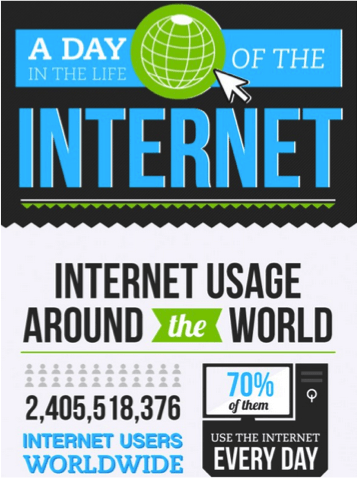 According to this great info graphic from the Culture-ist, there are around 2.5 billion people using the Internet worldwide. One of those billions of users could be looking at your company’s website--right now as you read this blog post. When looking at your website, ask yourself a few questions: Does your website provide your current and prospective customers what they want? For example, do you include details of your electronic manufacturing company’s history? Information about your team members? Your equipment capabilities? Are your webpages visually appealing? Do you have updated and relevant pictures of assemblies, circuit boards or control panels? If you offer online quoting, is it easy to navigate through? Is it user-friendly? All of these components are important to think about and implement. I’ve blogged before about the importance of a digital marketing strategy and using social media correctly when it comes to your electronic manufacturing company. You don’t want to be that business constantly pushing out excessive tweets about the circuit boards you offer and “why you’re the best.” You may be the best, but the way you may be telling your story doesn’t come off that way. Social media is a natural way to tell your company’s story. Whether it’s showcasing that new piece of equipment (which will allow you to better serve your customer), highlighting a company milestone (such as an anniversary showing the longevity of your business), or retweeting and responding to an industry or current event article (demonstrating you are up to date on trends and issues), there are many avenues to tell your story. To support the story you’re telling, great content is key. 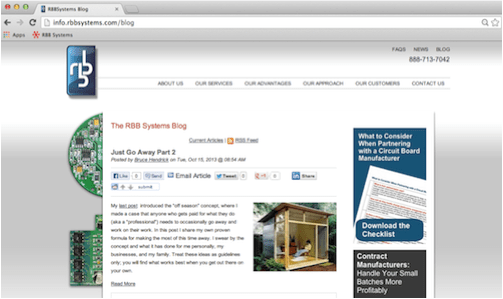 A first step to producing content for your electronic manufacturing company could be utilizing the company blog. You can use your blog to connect with fellow people in the industry, to share the different events going on in your company, or even address issues you’ve faced and overcome (electrostatic discharge anyone?). You can tell a story and educate others without being overly self-promotional and sales focused. Think of all the prospective and current customers that may be getting frustrated and therefore not contacting you for business. In reality, you could be engaging with all of them across a variety of platforms! Providing relevant and optimized content for your customers may take extra work but it demonstrates that you are an engaged and knowledgeable company to do business with. Most importantly… you’re sharing and delivering valuable content to the people (and possible customers) coming to your website. For more information you can read additional RBB blog posts, like us on Facebook, connect with us on LinkedIn or check out our YouTube videos to help build your network.